Scientists from eight countries are starting a research project on how to prevent one of the major behavioural problems on commercial pig farms: tail biting. The aim of the collaboration is to yield new knowledge which will help to remove the need for tail docking, the currently widespread preventive practice of cutting off part of the tails of young piglets..
Why do pigs’ tails get damaged? Tail biting is one of the major problems in modern pig production, both in terms of animal welfare and production economy. It is an abnormal behaviour that can result from several causes, such as stress, illnesses, a poor indoor air quality or competition for food or water. One of the main causes is lack of materials that the pigs can chew on or root. Pigs have a strong innate need for exploring their environment by chewing, biting, rooting and manipulating various objects and materials. When there are not enough exploration and manipulation substrate in a pen, the biting can get redirected to other pigs, especially ears and tails, which may result in tail biting. In many European countries, tail docking – the practice of cutting part of the piglets’ tails at a young age – is used to control the problem. While this does reduce the risk of being bitten, it causes pain during cutting. Is also possible that, for the rest of their lives, damage to the tail nerves caused by docking may alter the sensitivity of the tail to touch. Some farmers, consumers, legislators etc. would like to stop the practice of tail docking. The EU pig directive states that tail docking can only be used if other means of preventing the behaviour have been tried. In some countries, for example Sweden, Norway and Finland, the practice of tail docking already is banned., These countries therefore provide an opportunity for testing other methods to prevent tail biting without the need to dock. The FareWellDock project is a three-year research project starting this autumn in eight countries: the UK, France, the Netherlands, Denmark, Sweden, Norway, Finland and the USA. The overall aim is to supply necessary information for quantitative risk assessment of tail biting, and to stimulate the development towards a non-docking situation in the EU. 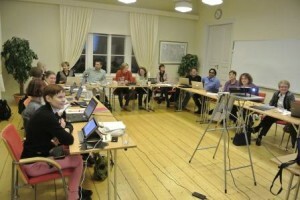 The start-up meeting of the project took place on November 5 and 6 in Finland, after which the research will be carried out in three complementary international researcher activities. One group will delve into developing improved measures to prevent tail biting. An essential part is research into reasons for tail-biting outbreaks: which factors in the daily life on farms actually trigger this unnatural behaviour? This is work package 3 of the project. The group in work package 2 will investigate what quantity of straw, or other chewing and rooting materials, would be sufficient to satisfy the pigs’ need to explore and therefore reduce tail biting risk, and how to improve the feasibility of using straw on farms with different manure systems. The third group of scientists (work package 1) will focus on finding out what actually happens to the piglets that are tail-docked: how much pain piglets feel during docking, whether this results in longer-term pain and how this compares to the pain which is experienced by pigs which are tail bitten should an outbreak occur. The project is led by Professor Anna Valros of the University of Helsinki in Finland. 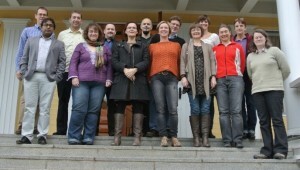 The other research institutes participating in the project are Scotland’s Rural College and Newcastle University in the UK, INRA in France, Aarhus University in Denmark, Wageningen UR Livestock Research in the Netherlands, SLU in Sweden, the Norwegian School of Veterinary Science and USDA-ARS in USA. The project is part of the European Animal Health and Welfare ERA-net initiative (ANIHWA), which aims at increasing cooperation of national research programmes on the health and welfare of farm animals. 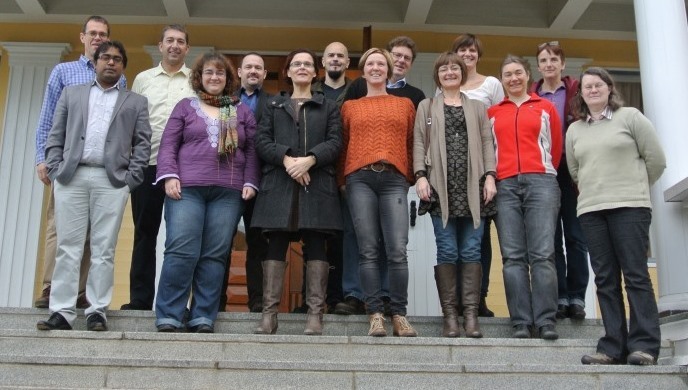 The first meeting of the FareWellDock took place on 5 to 6 November 2013 in Finland, with 19 participants. The meeting was started by updating each other on the first steps of the project taken so far in each of the six countries. Plans and scheduling for the upcoming three years were discussed, including plans for internal and external communication. While FareWellDock is a project focusing on research, effort will also be made to communicate the results to end users, such as farmers and stakeholder media. Discussions on methodology to be used in the project were also on the agenda, including the new and promising welfare measure called tear-staining. Matters of terminology were brought up by raising the question whether the word enrichment may be partly misleading: it suggests luxury, while chewing and rooting are fundamental needs in pigs. Part of the time in the meeting was allocated for the participants to split into three groups, according to the three work packages of the project. This gave the researchers from each participating country an opportunity to sit together and efficiently plan details of their work packages. The intensive and fruitful two days concluded with the first meeting of the steering group, which consists of one responsible coordinator from each of the six countries. In the future of the project, meetings for the entire project will be arranged once a year, with video conferences in between.